Fabric upper, with a 4" heel. 3/4" platform. 9.5" long from heel to toe. 3/4" Platform. See pictures of actual item for sale. Good condition, normal wear, no box. There may be aspects that are missed. We can not be responsible for the fit of an item due to the difference in styles and manufacturer. 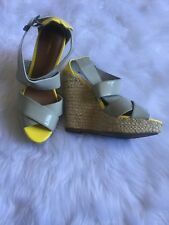 Xhilaration yellow and gray espadrille wedge sandals. Gently Preowned, Great Condition. Little Wear. Actual color could vary from the color your screen shows or from the flash/lighting when taking the photo. Beautiful leopard print "4 high stiletto heels. Zipper back. Size 7 new without box. Thanks for looking!! Style: Espadrille Wedges. Detail: Slip-on Canvas Espadrille Wedges, Cocoa Brown with floral trim and bow. Great condition. Material: Fabric upper, balance Man-made Materials. Heel Height: 4". Color: Cocoa Brown. Xhilaration Strappy Open Toe-Ankle Strap Heels Black,Red,White,Green Calico Women's Size 7m 9¼" Inner Shoe Length 3" Inner Shoe Width 5" Wedge Heels ~ 1½" Platform Please Check Your Shoe Measurements Excellent Pre-Owned Condition. 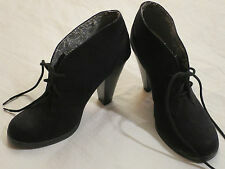 XHILARATION Black Round Toe Kitten Heel Mary Jane Shoe Womens 7 Med Career. Condition is Pre-owned. These Mary Jane style heels are adorable and go with any color as black is very versatile. They are in EUC except for marks on the inside of the heel where they where hung on a shoe rack. Women's Shoes Xhilaration Pumps Slip On Formal High Heels Bow Brown Size 7 Condition is Pre-owned. Shipped with USPS Priority Mail. "Pony Hair" upper. Fun, Leopard Print. cow/goat hide, shaved to simulate horse hair. Comfy canvas lining. shows little wear. Insole length 9" tip to heel back. Booties are in Excellent pre-owned condition. Minor wear, scratch on right heel. See pictures for details. "Pre-Owned shoes aren’t perfect. Exterior width: 3". These Xhilaration Red Floral Platforms are in very good condition and gently worn. These Xhilaration Red Floral Platforms sh ip with relevant accessories and may arrive in a generic white or brown box. TheseXhilaration Brown Wedges are in very good to excellent condition and gently used.